SFP Port or RJ45, Which is Good for Switch Cascading? ← Mini GBIC vs SFP: Is It the Same? Gigabit switch that offering greater speeds and compatibility has gained in much momentum in the field of networking. And with the unceasing demand for more bandwidth, the network will grow to the point that we need to connect several gigabit switches together. Switch cascading is one of the options to link more than one-gigabit switches. But here comes the problem: should I cascade switches via an SFP port or just through standard RJ45 ports? Is there any difference in regard to the speed and distance. This is we’re gonna explore in the article. Cascading more than one switches enables us to have multiple ports interconnecting each of the switches in the group. But they are configured and managed independently. Switches that are cascaded together should all support Spanning Tree Protocol (STP), in order to allow redundancy and to prevent the loop. Generally, switches of any models or from any manufacturers can be cascaded. There are two options to cascade switches, either use copper SFP (1000BASE-T SFP) and fiber SFP port or via the standard RJ45 port on the Gigabit switch. SFP port enables Gigabit switches to connect to a wide variety of fiber and Ethernet cables in order to extend switching functionality throughout the network. The SFP port allows the switch to connect to fiber cables of different types and speeds via fiber SFP module, or even connect to Ethernet copper cables through copper SFP module. As hot-pluggable I/O devices, both fiber SFP and copper SFP models can be used on a wide variety of products and intermixed in combinations of 1000BASE-T, 1000BASE-SX, 1000BASE-LX/LH, 1000BASE-EX, 1000BASE-ZX, or 1000BASE-BX10-D / U on a port-by-port basis. For more details on Gigabit switch SFP port and how to use SFP ports on switches, please read What Is SFP Module Port of Gigabit Switch? RJ45 ports are built-in ports in Gigabit Ethernet switch. To connect two RJ45 ports, Cat5e or Cat6 copper network cables are generally adopted. Here lists the specification of each network cable. For fiber SFP port vs. copper SFP (or built-in RJ45 ports ), the benefit of using the fiber SFP port for switch cascading is that you will have more Ethernet ports available for your end points connections. Besides, both RJ45 ports and copper SFP module use electric signal to transmit data, fiber SFP module, however, uses light signal can tolerate longer distances and is less prone to interference. The other criterion is that fiber SFP module in most Cisco SFP switches is capable of higher speeds than the normal copper ports. While for copper SFP vs. RJ45 ports, things become far easier. As they both utilize electric signal to transfer, the two options are basically the same. Except that the copper SFP module would generate extra costs and increase installation time. So when it makes sense to use copper SFP module instead of RJ45 ports? Only for cases where you need to connect between an all-SFP distribution switch and an all-copper edge switch. 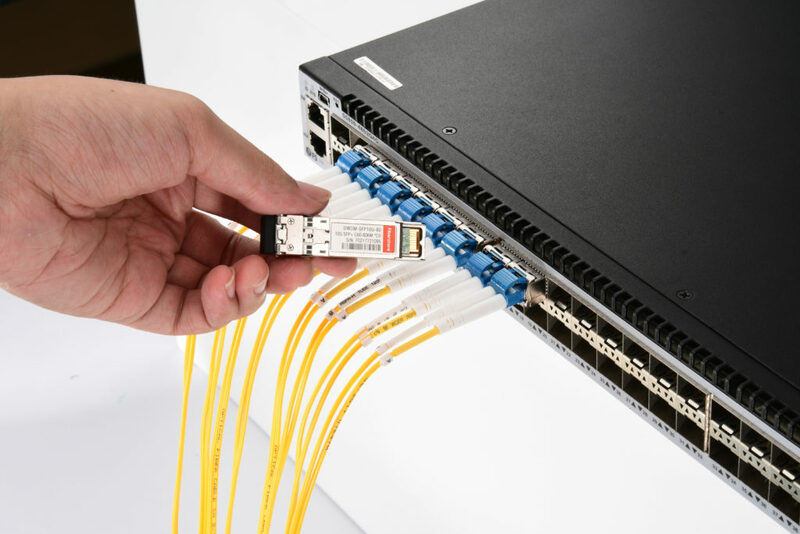 The reason the switches have SFP slots is to support connecting to a fiber optic network, either to talk to other fiber optic gear or especially to connect over distances that copper transmission can’t support at gigabit speeds. It is thus clear that the choice between fiber SFP vs. copper SFP vs. Rj45 port when cascading switches actually depends on your specific cabling environment, and where the cable run is going. FS.COM offers a broad range of copper and fiber optic transceivers that fully compatible with major vendors on the market, which makes us the vendor of choice for optical network components and solutions. For any further information, please visit www.fs.com or contact us directly via sales@fs.com. This entry was posted in Copper Transceivers, Fiber Optic Transceivers, SFP and tagged 1000BASE-SX, copper sfp, fiber sfp module, SFP module, sfp port. Bookmark the permalink.